The guitarist - who replaced Slash on tour with the rockers after he quit the band - told Yahoo!7 Australia that Axl did not deserve his reputation for being one the most difficult men in rock. Ashba said: "I think a lot of people and the press try to blow it up and say he's an a**hole but everyone can be an a**hole if you get them on the wrong day. "One thing people don't seem to get is that he's genuinely funny and he's always joking around and telling stories to make people laugh. "I always say that if he wasn't a musician he'd be a great comedian. I wish the world could see that side of him because it's the opposite of what people have branded in their brains." 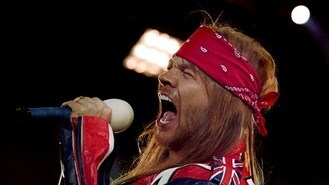 The guitarist also insisted the band's late showings at gigs are not because of Axl, as has been suggested, but because a team of 100 people is required to set up their equipment when they perform live. "We have a huge rig and pyrotechnics so often it's the case of fitting all that into the venue. Our number one priority is to make the shows safe," Ashba explained. "Our main goal is to go and give the fans a show they will never forget and we understand how expensive tickets are. "We take that into account and when we do hit the stage it's almost impossible to get us off," he added.